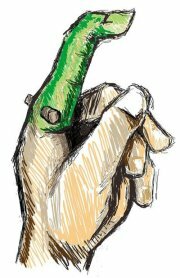 Halloween and the tale of the Frankenfinger! Walk your dog early, and before trick-or-treaters start their visits. People in costumes or simply behaving strangely can cause stress to your dog and they may react by wanting to run away, or even bark and bite (the dog, not the revellers!). No tricks, no treats – remember, chocolate in all its forms (as well as many other sweets) are poisonous to dogs. Only dress up your dogs if they enjoy it, and make sure that they are safe and can’t get tangled up. We certainly wouldn’t put a costume on Theo as it is likely that all the noise and activity will stress him out. Halloween costumes can annoy animals and pose safety and health hazards…so think twice before dressing up the dog. 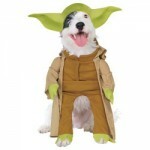 Make sure the dog can breathe, see and hear, and that the costume is flame retardant. Remove any small or dangling accessories that could be chewed and swallowed. Avoid rubber bands, which can cut off the animal’s circulation or, if accidentally left on, can cut into the animal’s skin. 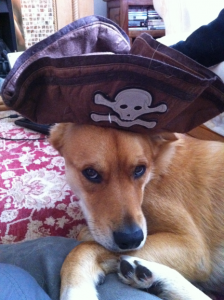 Halloween decorations can be eaten or broken, causing serious harm to your dog. Have fun and decorate – just think about your dog first!